Friday January 29th 1875. I rode to school with Will this morning He was going to the creek after ice. I walked home in the evening and when I got here found that Jennie and Vene had gone down town to make calls. I changed my clothes before supper and put on a wrapper. We played cards again in the evening. Tonight it was every one for themselves and I came out ahead -- -- bravo. 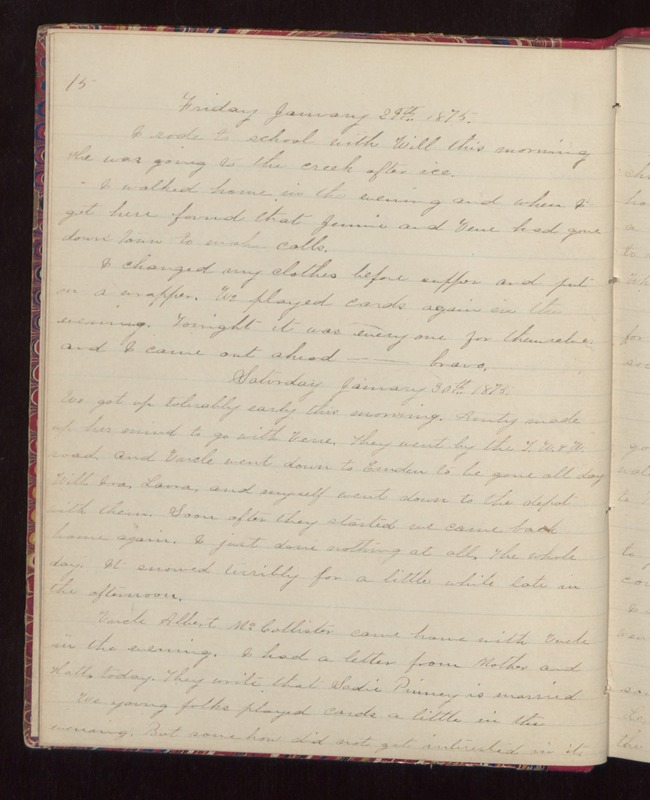 Saturday January 30th 1875 We got up tolerably early this morning. Aunty made up her mind to go with Vene. They went by the T.W.& W. road and Uncle went down to Ernden to be gone all day Will, Ira, Laura, and myself went down to the depot with them. Soon after they started we came back home again. I just done nothing at all, the whole day. It snowed terribly for a little while late in the afternoon. Uncle Albert McCollister came home with Uncle in the evening. I had a letter from Mother and Hatt today. They write that Sadie Pinney is married We young folks played cards a little in the evening. But some how did not get interested in it.